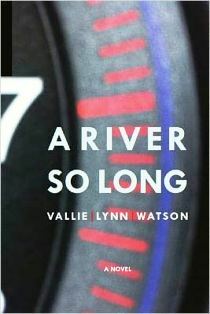 Referring to Vallie Lynn Watson’s new book, A River So Long, as a “novel” puts the term in its truest context: a work very new and modern in style and content. Relatively slim in total and narrated in imagistic vignette-like chapters, the novel allows the reader to glimpse into the life of Veronica, a barely married traveling businesswoman whose emotional baggage and illicit affairs are scattered all over the continental United States, with pieces of her life languishing in Phoenix, New Orleans, New York, Boston, Wilmington, and Memphis, and in the Birmingham of her past. The emotional complexity of the story represents its main strength, and that quality needs to be present to stand in place of a traditional plot and narrative arc. A look into the background of Veronica’s failing marriage starts us off in Phoenix, Arizona, and by the time her friend and business associate Van moves to New Orleans, the ball is set rolling as Veronica’s friends and lovers—and some people who may both or either—come and go, creating a ephemeral collage of relationships: co-worker Van and his domestic partner Trinh, old friend/old flame Dylan, the married couple Kate and Beau, the unlikely lover Enzo, and Dylan’s sister, the elusive movie actress Maggie. At one turn Veronica may seem heartless and cold, as in when she takes a one-hundred dollar bill from Enzo’s wallet and then goes to Beale Street alone while he is sleeping in her hotel room, yet writing her off that simply can’t be done, as in when she writes “I LOVE YOU” in Sharpie on the underside of her Little Dog’s collar as she is packing her things to leave her husband. Watson’s Veronica stands as a distinctly modern kind of woman, but also as one who, we fear, exists with few or no possibilities of redemption or happiness, left only with a career that carves out for her a life lived in hotels, restaurants, and friends’ guest rooms. The scenes of Veronica’s life that we get to witness come more like bits of data in an Internet search than like plot points in a linear story. So, by the end of the novel, we are left wondering if this woman who has been through so much—and who has put herself through so much with own behavior and choices—will transcend the bleak and confusing circumstances: will she remain in her painful somewhat-self-made limbo for the long haul? Watson does not allow us to know for certain, instead leaving us to decide for ourselves. Foster Dickson is a writer, editor, and teacher in Montgomery, Alabama.